Now let's see, which is more important? 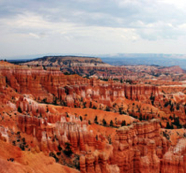 Would it be: Bryce Canyon or Big Oil? Let me think: Bryce Canyon or Big Oil; Bryce Canyon or Big Oil; Bryce Canyon or Big Oil? One is a famous, spectacular, unique, and inspiring wonder to behold, while the other spews filthy toxins into the air and creates visually and actually toxic sprawls. Where wonders once dominated the landscape, giant prying mantis-like rigs pumping black gold would work away. Take just a moment to close your eyes and imagine the clear night sky above Bryce Canyon, with its natural diamond-studded blackness and an air of magic. Stars of all sizes and degrees of brilliance and brightness shine or flicker; occasionally you may even be treated to a star shooting across the infinite sky. Now compare that to the of skies that you see on the highways as you approach the quality of air, or I should I say the quality of air pollution, that Big Oil offers you to breathe and view everywhere they lay their greedy gaze. The proposed Alton mine at Bryce Canyon would pollute the air, reduce visibility and flood the night sky with light, but not the light of stars shining splendidly from space. And don't let the Bureau of Land Management (BLM) convince you that the lights they would place there would be a treat. Maybe that would be the case at a stadium or other man-made structure, or any other place where humans hold dominance over nature. But compete with the beauty of the actual night sky above nature’s wild lands? I think not. It’s a lie that only the most naïve urban dwellers, who have never seen the night sky from outside their city limits where stars don't have to compete with street lights, tall buildings or beams of light thrown by mechanical force, would believe. Such lies are offered up whenever there are profits to be made at the expense of the environment, the beauty of the land, the public’s health and the things we hold sacred. Jobs, yes, there will be jobs, but at what cost? Why not create jobs in this country that will break America of it’s addiction to that which will destroy us? I want my grandchildren to see America the beautiful, not just in history books, but as a living testament to both its beauty and to the idea that we the people honor the things that are truly important to the spirit, rather than allow them to be sacrificed. But I do want them to read about fossil fuels in their history books and how Big Oil is a thing of the past. And I want America to stop allowing the profits of the greedy few to trump the public’s wellbeing.